A stroll down a quiet track to the sea and coastal path. Located three miles from Elie's blue-flag beach. Located just 10 miles from St Andrews and three miles from Elie's blue-flag beach, Lahill is an idyllic, secluded location for a peaceful break. Furnished with an eclectic collection of antiques and family mementoes, guests are welcome to use the drawing room, and breakfast is served in the dining room which looks out over paddocks where the family's horses graze. Each bedroom has a private bathroom and parkland views. Visitors are welcome to use our all-weather tennis court. Lahill is within 30 minutes of 40 golf courses. St Andrews old course is less than 20 minutes drive, and the new course at Kingsbarns is just 9 miles away. Fife's famous coastal path is just 15 minutes walk down a peaceful track. Nearby there are cycle ways, riding, off roading, hiking, fishing, water sports, bird watching and much much more! Low Season: £70.00 per room. Single Occupancy: £40.00 or £50.00 respectively. Follow the M90 and leave at junction 2a. Follow the A92 to Kirkaldy, then follow signs to Leven, along the A915. At Leven, follow signs to Largo and St Andrews, along the A915. A mile after Upper Largo, take first left (signposted Newburn). 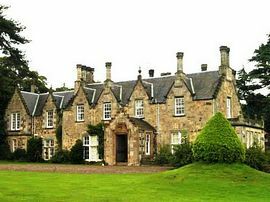 Lahill is a quarter of a mile along there - turn left at the lodge and follow the drive half a mile to Lahill House.